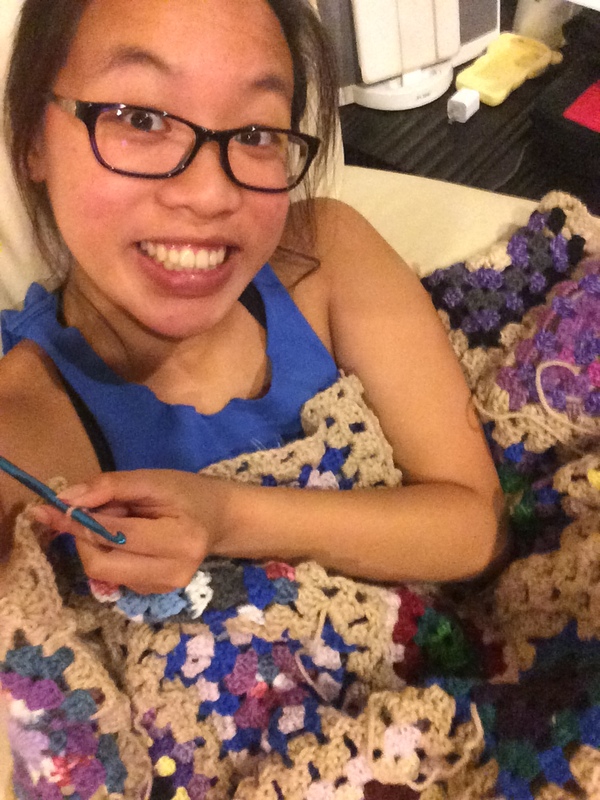 It’s not that I don’t have time to craft but that it’s become such a hassle to figure out good lighting to take a picture, edit, upload, and write. 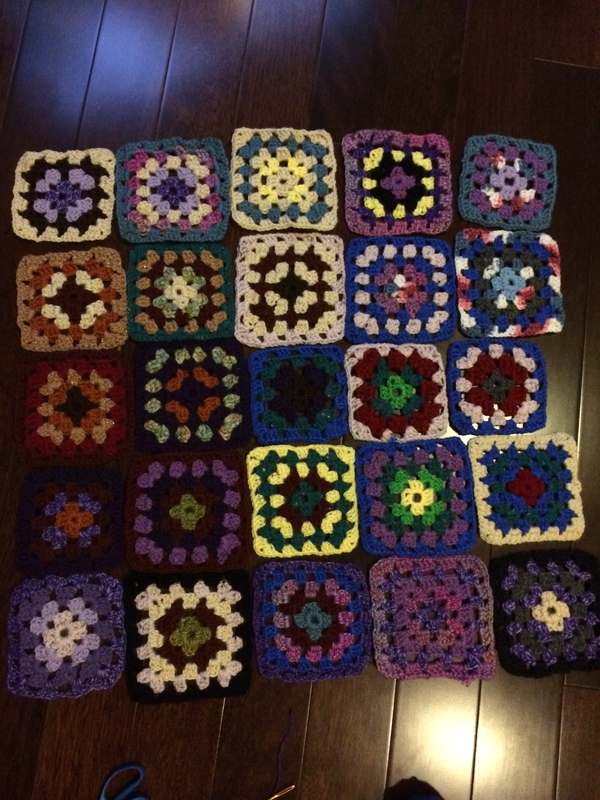 However, here’s a handful of things I’ve been working on over the past couple months. 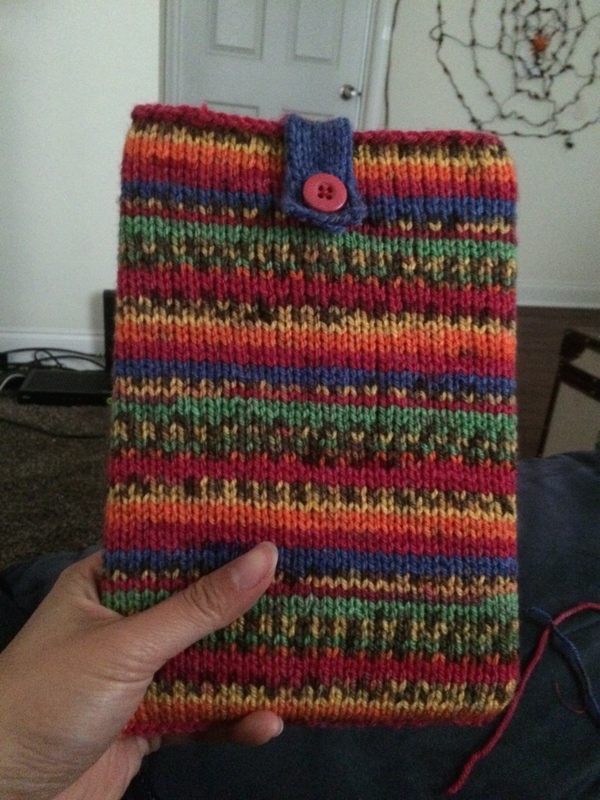 I bought an iPad mini as a self birthday gift and made a sock out of some of the self-striping yarn I bought in Hong Kong a couple summers ago. 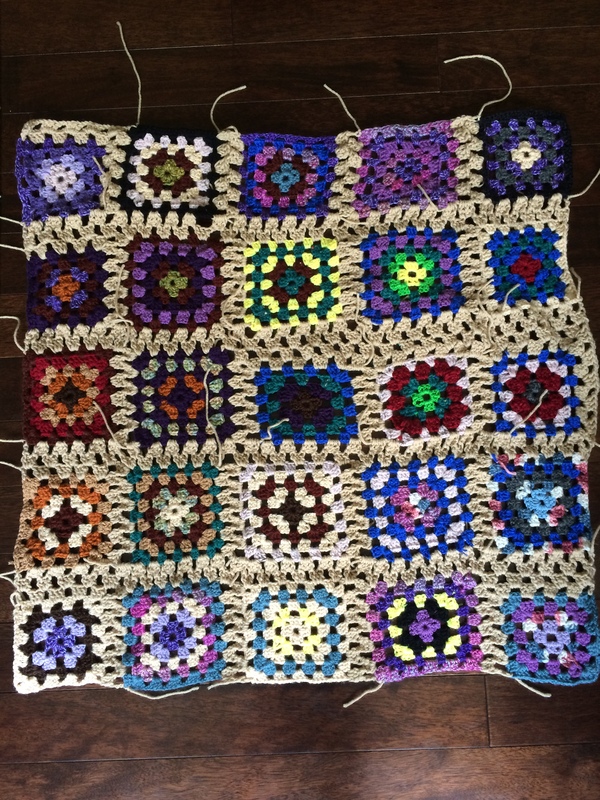 I’ve also been slowly working on my granny square blanket. It’s a loooooong process. 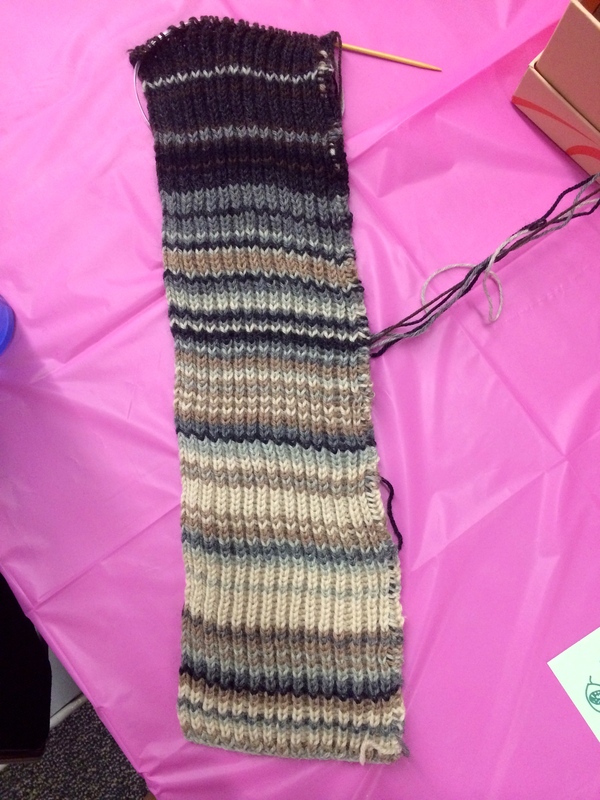 Next up I’ll being doing a long overdue Sky Scarf update. A couple of days ago I posted about my drop spindle adventure. 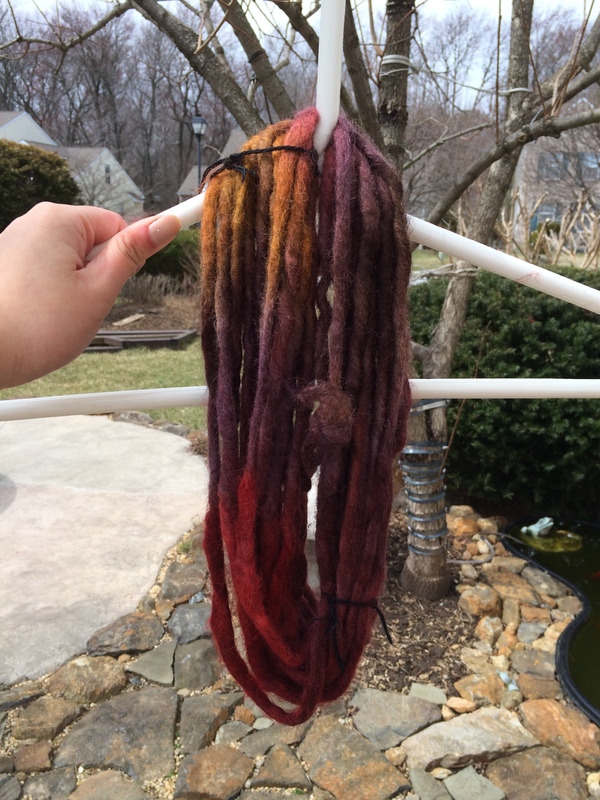 After spinning my own yarn, the next step in the process was to dye it. 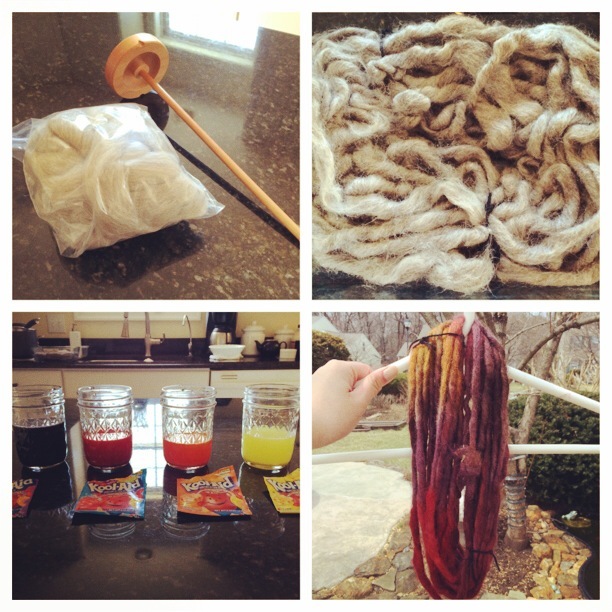 I’ve read about Koolaid yarn dyeing for the past couple of years and I never got the chance to try it out. I thought that this would be the perfect opportunity to give it a go. 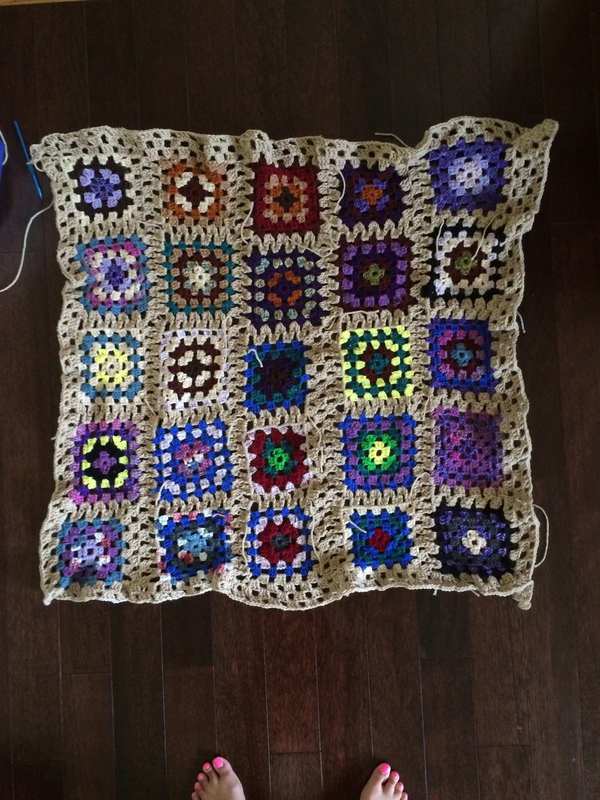 Koolaid is a surprisingly great way to add color to wool. 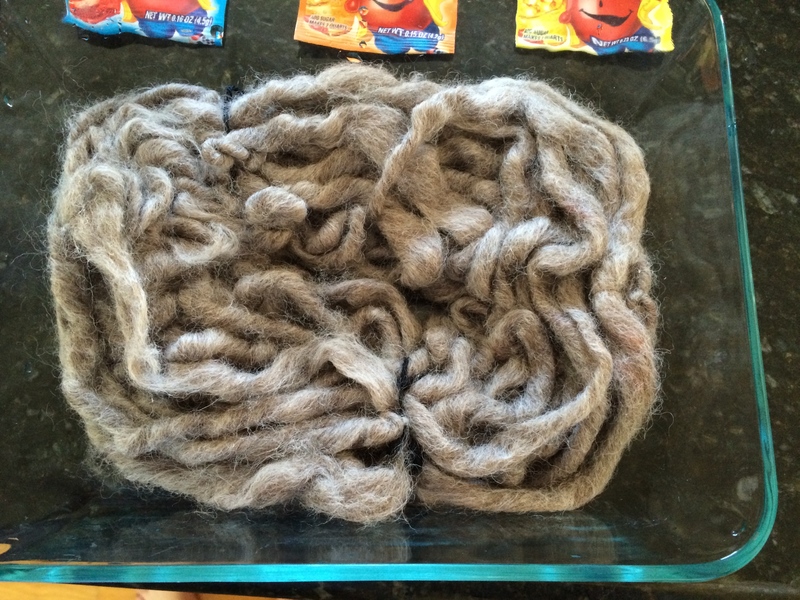 It’s safe (although I question what it does to your body if it sticks to wool so easily) and cheap. I was able to dye my hank of yarn multiple colors for under $1. 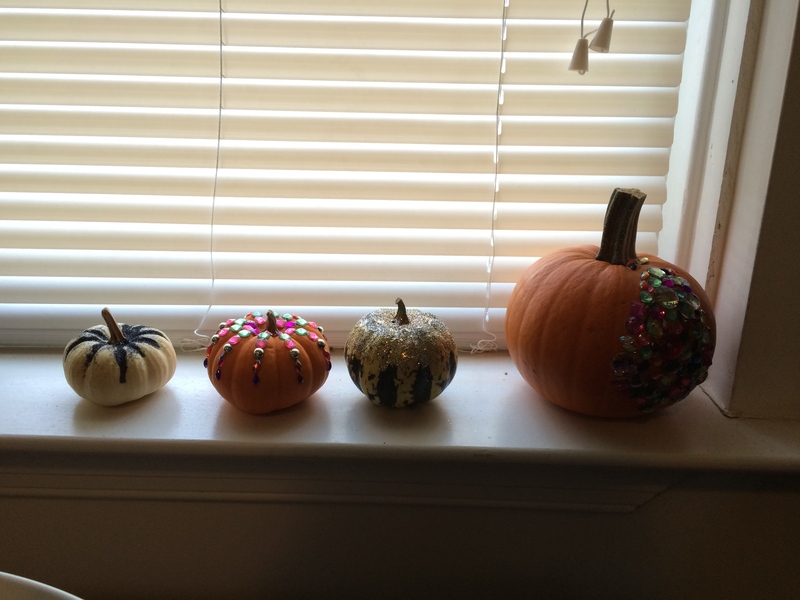 Here are some great instructions that I used as a guide. So first I put my hank of yarn in a microwavable dish. 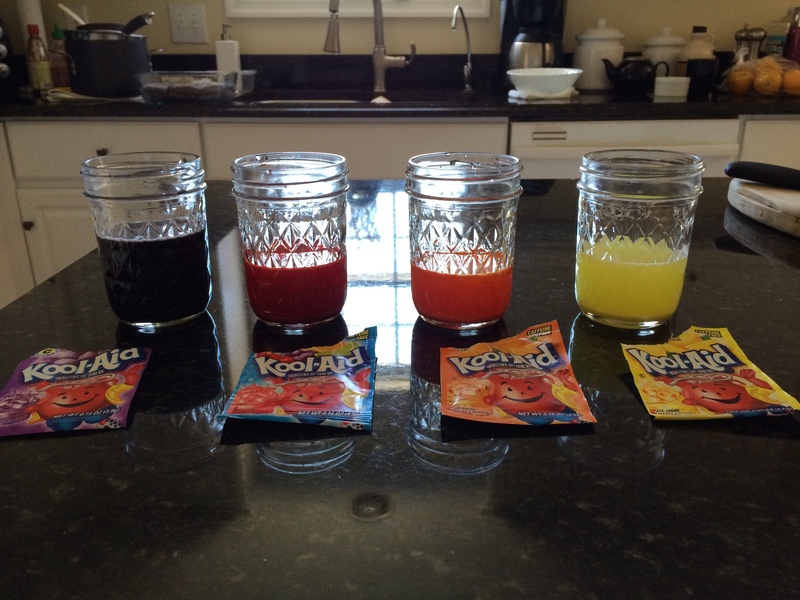 I prepped my Koolaid. I used five colors. Tropical punch flavor is deceiving because I thought it was going to be blue like the package but it was actually red. I was happy with the result nonetheless. 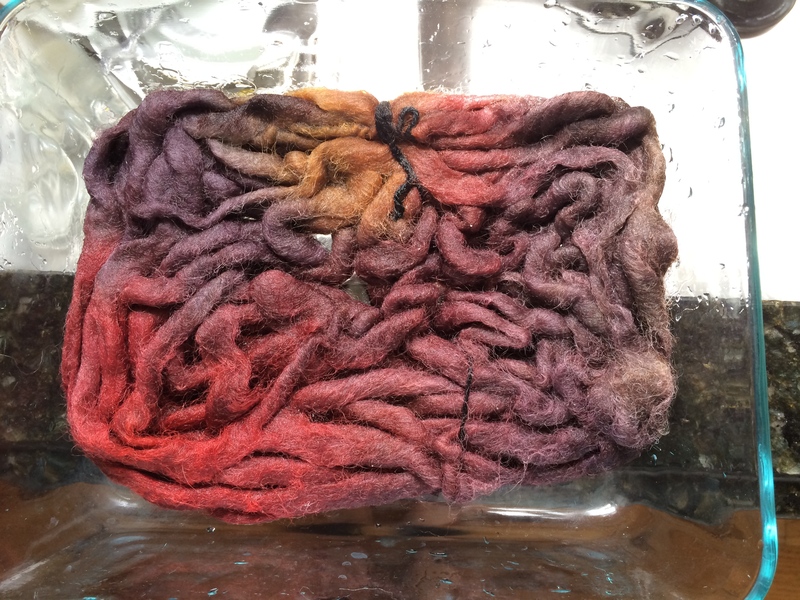 It actually doesn’t matter how much water you use because what will happen is that the fiber will absorb the dye from the mix and leave behind clear water. 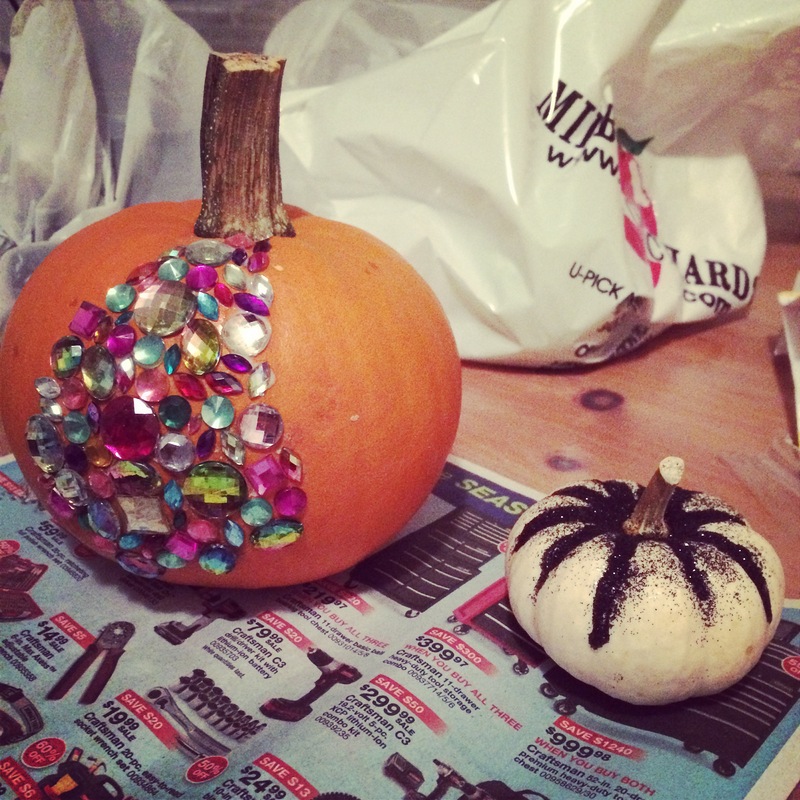 It’s kind of magical. Water is just used to help evenly distribute the dye. 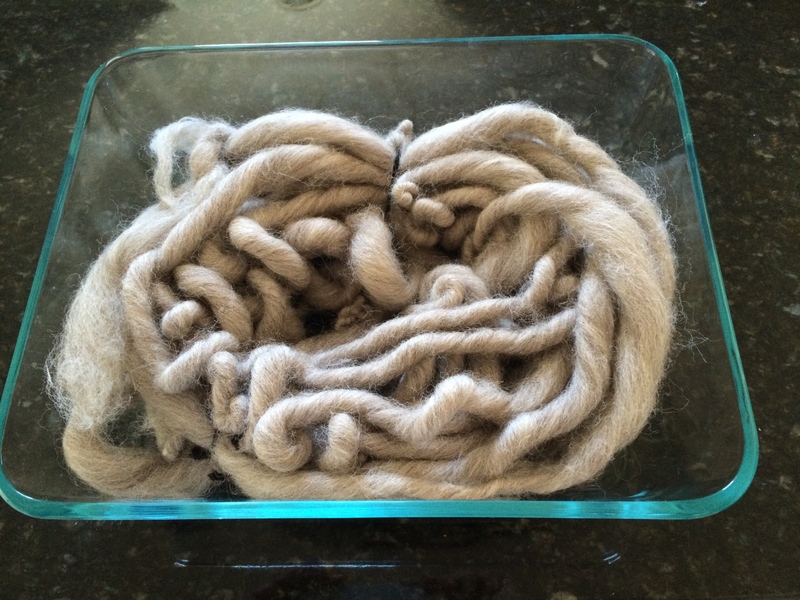 I washed my wool with water and some dish soap to prep it for the dye. The amount of Koolaid I used to dye this bit of yarn was probably excessive but it really helped bring out the colors. 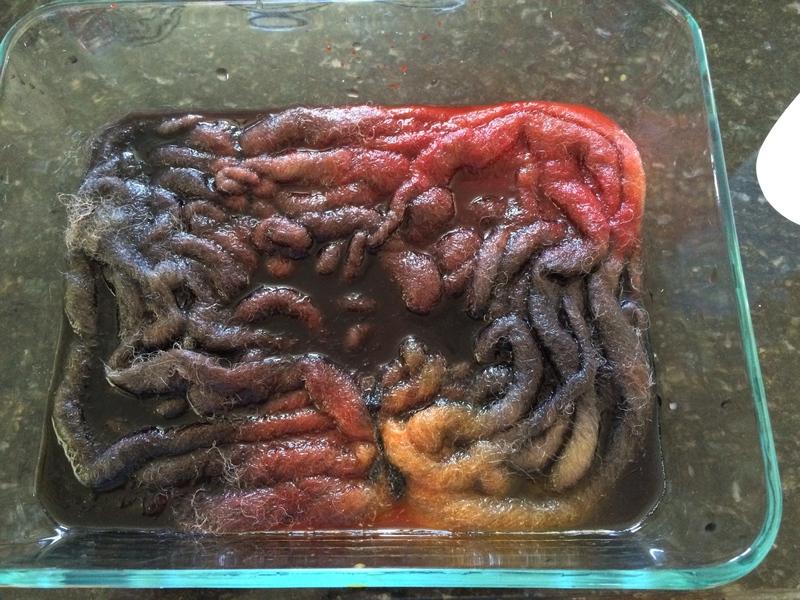 The main difficultly with using that much color was that it took a longer microwave time to let the wool completely absorb the dye. I covered the dish with plastic wrap and microwaved it in two minute intervals for a total of eight minutes. Once the excess water comes out clear you know it’s ready. 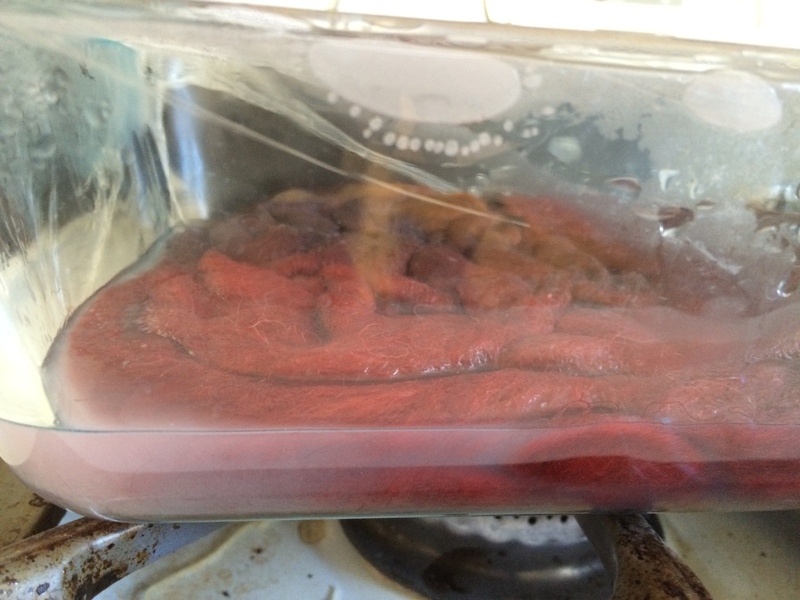 Then I let it cool for about four hours before giving it another rinse in warm water. Apparently shocking the wool with different temperatures will cause it to felt. I left the dish on the stove and my dad thought it was food. Awkward. I washed it with warm water and dish soap again, and finally I could see the result! 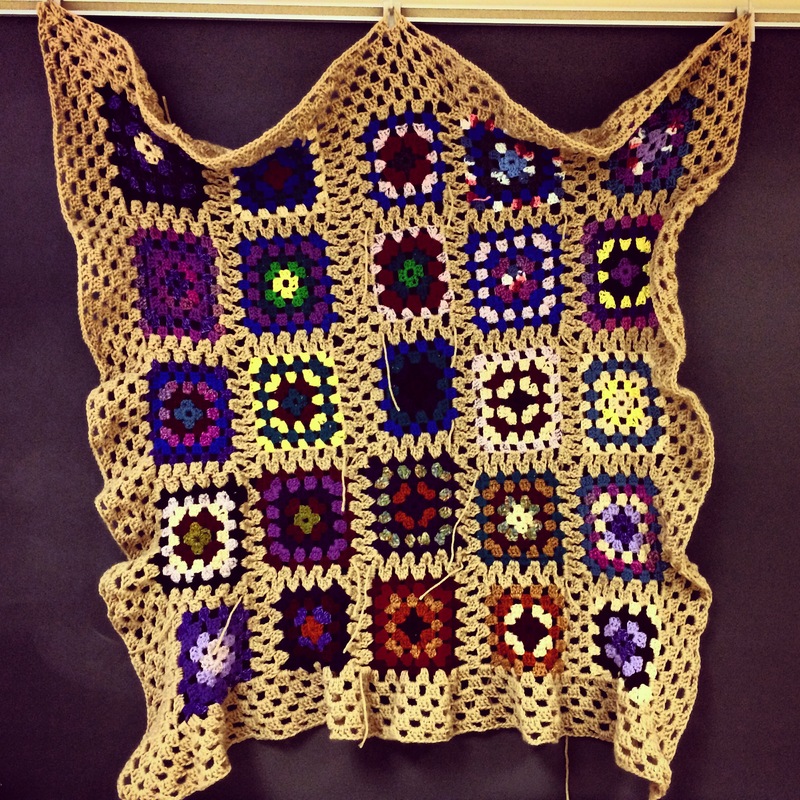 Koolaid makes the wool smell soooo good. Not like a wet sheep at all. Then I took the hank and hung it on a clothes hanger on a tree outside so it could dry since we’ve been having nice weather in Delaware recently. It took a long time to dry and I was super impatient to see how the dried yarn would look so I tried to keep occupied by instagramming. I really love how it turned out. 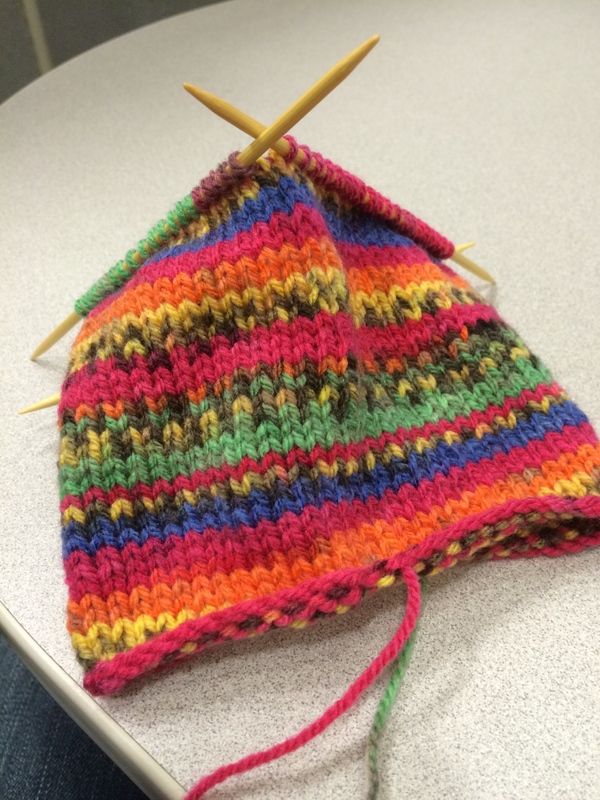 I’ve already planned on knitting a chunky headband for next winter with this yarn. 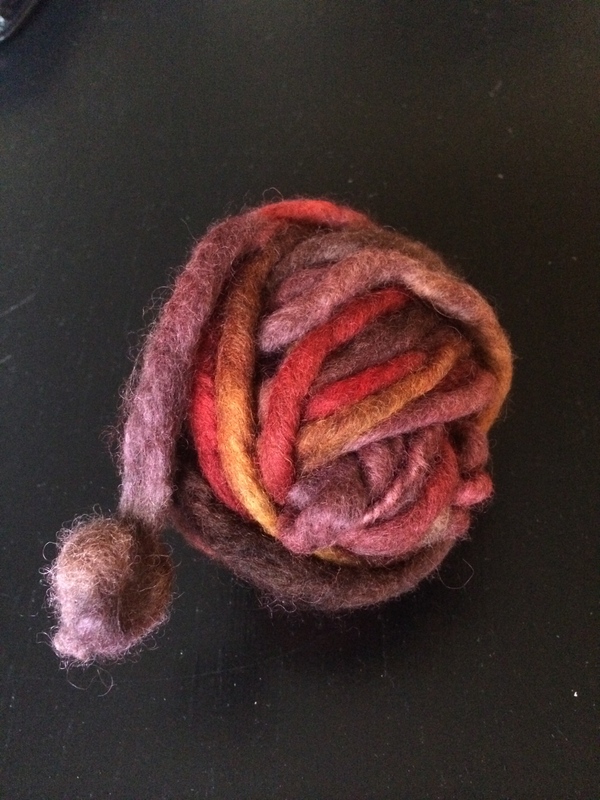 I really want to spin and dye my own yarn again soon. This is becoming an addiction.